If you’ve ever seen a photo of a snowflake up close, you know how beautiful and intricate they can be. People say “no two snowflakes are alike”–this is true, because of the way snowflakes grow. Each snowflake grows according to the crystal structure of ice and the conditions it experiences as it falls to the ground. From Wikipedia, click for link. What is an ice crystal? A snowflake is a single crystal of ice. Many substances are crystalline, but most of the ones we encounter are polycrystalline, or composed of many crystals. Some examples of crystalline materials are metals, bone, ceramics, and jewels. Different kinds of crystals grow in different ways– some are cubic and some are hexagonal. (You can see great crystals in the Smithsonian Natural History Museum in Washington, DC. Some pictures are in this link.) Table salt, for instance, is cubic. Salt crystals, via Tony Wong on Flickr. Snowflakes are so varied because each snowflake experiences a slightly different environment. Tiny differences in temperature, pressure, and moisture change how each snowflake grows. In the snowflake above, you can even see flaws in tiny parts of the hexagonal symmetry. 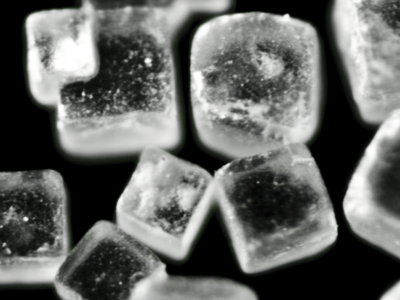 Even across a snowflake, tiny differences change how the crystal grows. Snowflakes as big as a dime have been documented, but theoretically, there is no size limit. 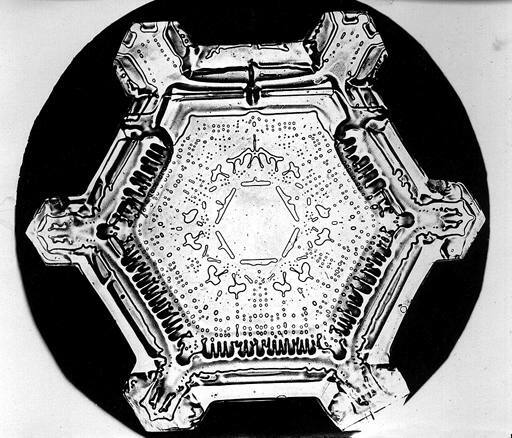 One of the first photographers of snowflakes was Wilson Bentley. He photographed over 5,000 flakes from his home in Vermont in the 1800 and 1900s. The children’s book Snowflake Bentley describes his life and work. Ken Libbrecht, a professor of physics at Caltech, also maintains an awesome website about his research on snowflakes. In his lab, he studies how to grow snowflakes, to better understand the conditions under which they form. He has grown crystals up to an inch wide. His Field Guide to Snowflakes is a beautiful and informative resource on snowflakes, accessible to all audiences. This entry was posted in Science and tagged crystals, hexagon, hexagonal, ice, ice crystals, ken libbrecht, photography, science, science photography, snow, snowflake bentley, snowflakes, weather on December 16, 2013 by Vironevaeh.